Which Korean company do you think has penetrated the deepest into the lifestyles of Chinese people? By assuming that ‘lifestyle’ means watching, listening, eating, working and enjoying, which Korean company do you think has resonated the closest to Chinese consumers? Recently, China is seeing rising awareness of safe food as a result of the growing power of female consumers, and the rapid growth of the middle class is also resulting in the increasing demand for leisure culture, spurring a 'fun' sense of consumption. In this situation, the growing popularity of K-Culture is leading to new interests and demand for industries related to watching, eating and having fun, providing new growth opportunities to CJ brands who suggest a lifestyle for "food, leisure, beauty and fun" based on K-Culture. 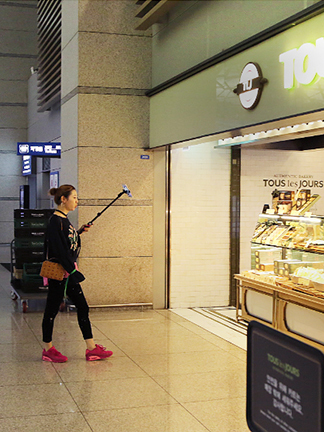 The food business is the driving power behind present-day CJ in both Korea and China. CJ Dashida has been a great brand solver for CJ's business in China. 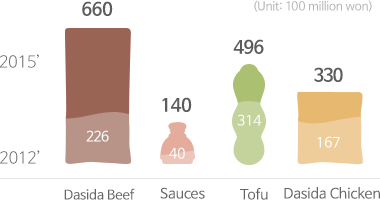 Led by Dashida, CJ CheilJedang brands have built their competitiveness in the Chinese food ingredient market covering various areas, including bio, feed and tofu. 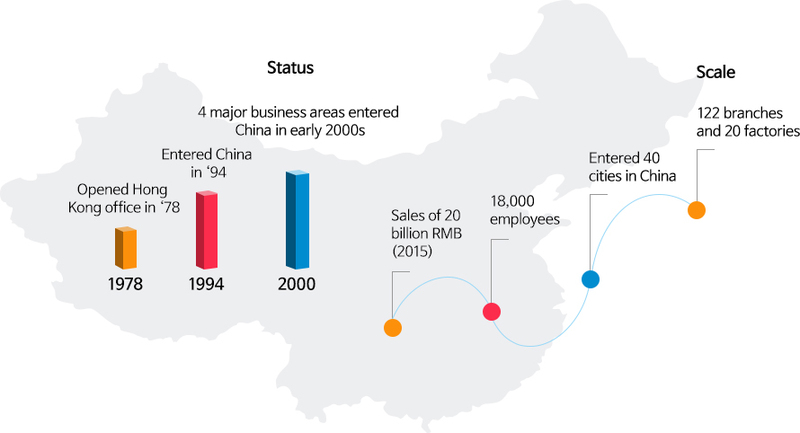 Baiyu Tofu, which was released in 2007 in partnership with Ershang Group, Beijing's largest food company, recorded a market share of 70% in just two years. 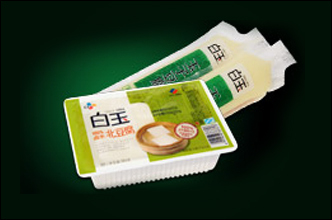 Based on CJ technology and production knowhow combined with Baiyu brand, the product ranked first in the packaged tofu market in Beijing and Tianjin. CJ is also striving to secure product safety and improve quality in preparation for the tightening food safety law in China. As there were growing interests in safe food in China, the limited partnership released packed ingredient products such as a bean sprout packs, yielded another solid hit in the market. 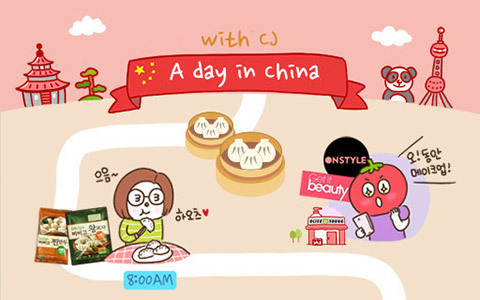 As the Chinese food ingredient market began to show keen interest in safe food, CJ Freshway regarded this as an opportunity and has aggressively targeted the old-fashioned Chinese food ingredient distribution market through its distribution system that was built based on its experience in Korea, generating positive business results. As of August 2015, CJ Freshway was supplying CJ products including Bibigo to over 350 stores of Yonghui Mart, a large Chinese distributor. The company also plans to acquire online and offline food ingredient distributors based in Beijing and Shanghai. "Given that there is growing demand for safe food in the Chinese food ingredient market with the ever-increasing per capita income and consumption levels, this business looks to be very promising," remarked a source from the company. Under the goal of providing customers with safe and functional food, the company is striving to become the largest soybean food company in China. With its global brand "Bibigo", CJ CheilJedang is also leading the diffusion of K-Food in China. The early success of Bibigo in China is the result of the company's thorough preparation for the global market including China. Under the belief that if it wants to succeed in the global market, it must first satisfy domestic consumers, CJ CheilJedang released a wide range of Korean food products in Korea and underscored their competitiveness through appealing to domestic consumers. The company created six strategic products, including frozen dumplings, sauces, kimchi, ready-made rice (Hatban) and dried laver, in this way, and conducted branding efforts to promote the value and excellence of Korean food. Bibigo Dumplings, which became a strong seller in China, also underwent this process. Bibigo Dumplings are attaining high popularity in China, Hong Kong and Taiwan, being referred to as "K-Style dumplings". Unlike Chinese-style dumplings whose skin is thick, Bibigo Dumplings are thin-skinned dumplings packed with functional fillings such as vegetables. The reaction from Hong Kong has been particularly notable. The product sells in most of the large marts in Hong Kong, and has kept its No.1 position in sales among non-Chinese dumpling brands. It is now an iconic K-Food cherished by Chinese consumers. Bibigo Dumplings are captivating the taste of various consumers in China with its Korean style that is differentiated from Chinese style. OnStyle and O’live Young are also well known among Chinese consumers as a major channel and shopping platform representing K-Beauty trends. OnStyle opened its brand shop in Tencent, China's largest portal site, in last April, and has generated a huge success through various programs, including Get It Beauty, Channel SNSD, Charm TV and My Bodyguard, recording the following results in the fashion beauty category: No.1 in average views, No.1 in video-specific views, No.1 in the number of subscribers, and cumulative views of more than 200 million. The live broadcast of SIA (Style Icon Asia), the largest Asia style festival held in March, recorded as many as 8.56 million concurrent viewers. This success is partly due to OnStyle having made efforts to differentiate itself from other channels by, for example, disclosing unaired footage of Get It Beauty. Star Style Hot Ranking, which aired last June and explored the style of Korean celebs from the eyes of Chinese people, and Seoul Diary, which vividly showed the lifestyles of Chinese fashionistas living in Seoul, were also embraced by many Chinese viewers. This indicates that OnStyle is recognized among Chinese users as a major channel from which they can see the lifestyle trends in Korea and gain insights about fashion, beauty and fitness. Predicting that interest in K-Style would expand to fashion, beauty and the body in China, OnStyle strategically launched its brand shop in Tencent, the largest portal site in China. Innerb plans to raise its brand awareness in China where consumers regard healthy and clean skin as being more important than fancy makeup. As Korea's major K-Beauty platform, O’live Young is a CJ brand that has become renowned among Chinese people. In particular, its flagship location in Myeongdong, a User-Experience mall where users can experience and buy K-Beauty, is a hot place visited by a great deal of 'youkes' (Chinese tourists). According to the reported sales for the period from October 12 to 18 when the health & beauty store O’live Young held a Mid-Autumn event, sales of healthcare and functional food rose noticeably. While most of the five best selling products during the last year's Mid-Autumn event at O’live Young, which is the must-visit site among Chinese tourists in Korea, were beauty products (mask pack, cream, hair serum and mini iron), this year's top rankers consisted of healthcare, inner beauty and household items. CJ CheilJedang's No.1 inner beauty brand Innerb is receiving attention as a CJ brand that will lead K-Beauty in the future thanks to its success in the domestic market. According to a survey, Innerb was the third most sold to youkes who visited O’live Young during the Mid-Autumn period. Based on the strategy for making more than a half of its online sales in China, Innerb recently opened a shop in jd.com, China's major online shopping mall, following last year's opening of its shop in the international mall of Tien Mao, run by Alibaba Group, and the Dongbang CJ online mall. The company also plans to open a store in Sa Sa, a Hong Kong-based major drugstore, as well as duty-free shops. In addition, the company plans to release Chinese-exclusive inner beauty products. Han Jeong-Yeop, health marketing manager of CJ CheilJedang said, "We will develop Innerb as an iconic K-Beauty brand through custom marketing for Chinese consumers, who have exhibited strong interest in functional food." CJ IMC, Dongfang CJ, etc. With the growth of local satellite television and the popularization of internet and mobile, the consumption behavior of Chinese people are also changing. The sensation of the television series < Descendants of the Sun > and < Cheese in the Trap > and K-Music has also been led by these media and new consumer groups consisting of Balinghou (born in the 80s) and Jiulinghou (born in the 90s). These new consumers (born in 80s and 90s) who enjoy informed shopping based on their taste through the internet and social media are a "trusted allied army" to CJ who suggests a converged shopping and restaurant culture linked with K-Culture. CGV is leading the lifestyles of Chinese viewers in cinemas by providing various promotion and discount events and seat selection service with its innovative and differentiated cinema space. CGV ranked first in the most beloved theaters in China in 2016, a feat accomplished now for the past two years. 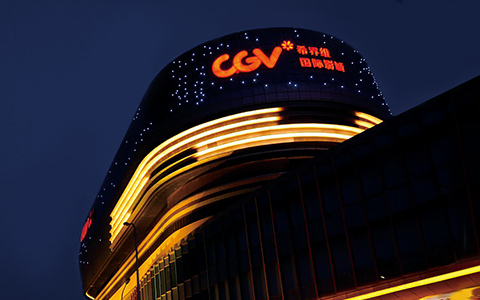 Starting with its first cinema in Daning, Shanghai, in 2006, CGV has opened 74 cinemas totaling 586 screens in over 40 cities in China, including Shanghai, Beijing, Wuhan, Tianjin, Fushun and Shenyang, securing an economy of scale. As of the first half of 2016, CGV ranked fifth in box office records in China out of over 270 multiplex operators and posted 19 million visitors just in the first half of this year, up 63% year-on-year. Last year, which was just the eleventh year after it entered China, CGV generated a surplus first time, posting sales of 220 billion won and an operating profit of 4.4 billion won. This year, the company posted sales of 89.3 billion won and an operating profit of 9.3 billion won in only the first half of the year. * Screen X: The world's first multi-side image system that CJ CGV developed jointly with KAIST, which features an extended screen consisting of one front part and two side parts. The success of CGV is attributed to its efforts to differentiate itself from Chinese cinemas by introducing a cultureplex (CULTUREPLEX), an upgraded version of a multiplex, where consumers can enjoy much more than just movies. The prime example is CGV Beijing Yidigang, which opened as China's first cultureplex model. Designed as a complex cultural space with CJ restaurant brands Bibigo, A Twosome Place and Tous Les Jours, CGV Beijing Yidigang has become a hot place in China that suggests a K-Culture lifestyle, with people calling it "a little CJ town". In addition, CGV installed 61 IMAX and 4DX screens in China. 4DX is the world's first five-sense auditorium launched by CGV. The company is also attaining popularity from Chinese customers by introducing advanced technologies such as ‘SPHEREX', a semi-sphere type special auditorium maximizing immersion, 'ScreenX', multi-projection theater and premium theater ‘SWEETBOX'. 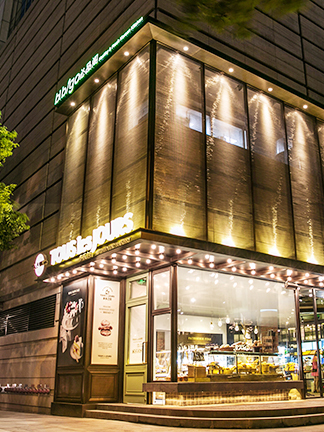 With its premium image and taste, Tous Les Jours is also making a huge success in China. To target broad regions effectively, Tous Les Jours has employed both "direct entry" and "entry via master franchise" strategies at the same time and has achieved successful results. Having started to actively expand its presence since 2013, Tous Les Jours is currently operating company-operated stores in six major cities, including Beijing, Shanghai and Tianjin, with business in 11 provinces and autonomous regions primarily through its master franchise system. The company recently opened the 100th store in Jiangnan Avenue, and Guangzhou. As of late September 2016, Tous Les Jours has a total of 121 stores in China. Tous Les Jours is very popular in China as a premium bakery brand. 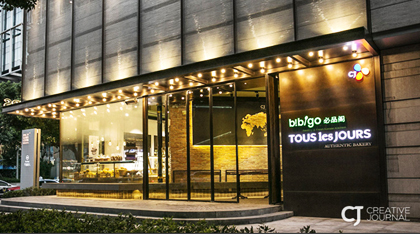 Opened in the Korea Town in Beijing in March 2014, "Tous Les Jours Boulangerie & Bistro" is one of the most upscale bakery stores in the world. The store ranked first in sales among the Tous Les Jours stores in China. Tous Les Jours Jing An Kerry Centre, located in West Nanjing Road, Shanghai, has introduced a new juice bar. Tous Les Jours plans to use this store as a prototype for introducing the juice bar to China and other foreign markets by offering various extracted juices, including detox juice and balance bottle for regular customers including office workers. Opened stores in Weihai and Suzhou. Opened premium store Tous Les Jours Boulangerie & Bistro in Beijing. Recently, Tous Les Jours is receiving attention once again as it opened a complex restaurant and culture space featuring differentiated menu suggestions and mood. This place is Tous Les Jours Jing An Kerry Centre. With its clean and premium interior design, the store serves not only baked goods but it also provides a juice bar selling various fresh fruit and veggie juices. "We intended to meet the needs of Shanghai customers for extracted juice," touted a source from the bakery company. "As the only premium bakery shop in West Nanjing Road, Shanghai, the store is expected to play a role as a launchpad for expanding our presence in China." tvN has been loved by Chinese viewers by playing a role in connecting Korea and China in cultural exchange, while taking the initiatives in spreading a Hallyu boom in entertainment, including shows and dramas. 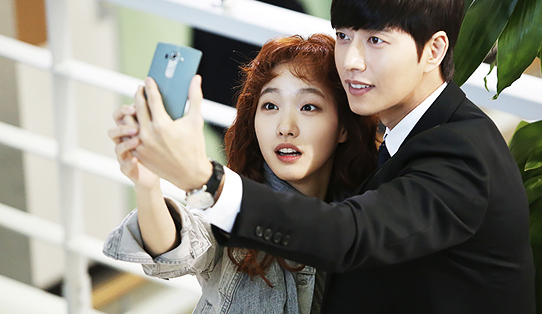 The series situated at the top of all this success is < Cheese in the Trap >, which aired from last February 1. Episode 9 of this series ranked first in the check-in count of Baidu Tieba with a record of 19,701 users, defeating unrivaled Korean drama series such as < My Love from the Star > and < The Heirs >. The Baidu Tieba check-in count is the most effective indicator for the degree of activities of specific tiebas as well as popular dramas. Thanks to its popularity in charts and search, < Cheese in the Trap > ranked first in views, overcoming Chinese dramas, and topped the charts of various video service sites such as Youku and Tudou, causing a tremendous sensation. With two other television series < Reply 1988 > and < Signal >, whose novel planning, well-plotted scenarios and excellent acting attracted many fans both in Korea and China, tvN recorded as many as three mega hit series in China in the first half of this year alone. In addition, < Entourage > starring Seo Kang-Joon and Lee Kwang-Soo, who are popular in China, the production of the entire episodes which were completed before its premiere, will be aired simultaneously in Korea and China, arousing expectations on another sensation. < Cheese in the Trap > is a campus romance thriller between the perfect guy with the perfect career, Yoojung (Park Hae-Jin), and ordinary female college student Hongseol (Kim Go-Eun). This drama was a mega hit in China. "Gangnam Fried Chicken", Bibigo "Bibimbap Meal"
Bibigo is currently implementing a premiumization strategy based on the uniqueness of Korean food under the concept of "Healthy & Fresh". Bibigo made a successful debut in the Chinese market with its Gangnam Fried Chicken, which reflects Korea's "chimaek (chicken and beer)" culture. On top of this, Bibigo's unique way of providing sauces such as red chili pepper paste, ssamjang (sauce) and lemon soybean sauce in the form of a pouch also gave confidence to Chinese consumers, who are sensitive to food safety, contributing to the growth of the brand in China. 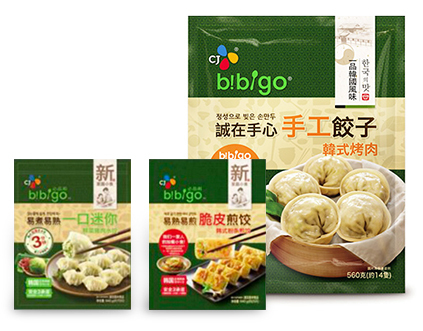 Bibigo's recent suggestion on premium K-Food culture based on differentiated "separately and together" interior design and menu has also been well received by many Chinese consumers. One good example is an integrated concept store in Jing An Kerry Centre, which opened early last month in West Nanjing Road, the core business area in Shanghai. As a store for testing out the potential of Tous Les Jours and its integrated concept store in China, this special store has Tous Les Jours on its first level and Bibigo on its second level. Decorated with premium Korean traditional items such as pots, windows and roof tiles, the store serves menu selections that were popular in the Korean Pavilion at the Expo Milano 2015, including "Bibimbap Meal" and "Japchae (stir-fried glass noodles and vegetables) & Kimchi Meal" for the first time among overseas Bibigo restaurants. The restaurant is also garnering attention with its interior design and menu differentiated from other Bibigo restaurants, serving everything from grilled seafood and meat dishes to various lunch special menu selections for nearby office workers, including Jeonju bibimbap. This move reflects the strategy and commitment of Bibigo to become an iconic premium K-Food brand in Shanghai through competition with other premium restaurants. Currently, Bibigo operates a total of 11 stores including integrated concept stores in China. Last month, Bibigo was selected among the top five most promising foreign restaurant franchise brands in China by SOHU, a Chinese online media with a focus on economy.